Guess what I just bought on Friday? Nope, I’m not an Apple fanatic. I don’t own a Mac laptop–didn’t you know that Macs are overpriced PCs? I had a work iPad. Which was awesome. Now I don’t have that work iPad. I’ve never stood in an Apple iPhone opening day line before. Before Friday that is. I had a 3 year old iPhone 4 and it was getting slow and the home button wore out. I had held out long enough and needed to replace it. I long debated jumping ship from Apple and asked my high schooler nephew for his opinion on Samsung vs. the Big A. My nephew had some profound advice–Apple is simpler, easier to use, more convenient, and it fits in your pocket better if you don’t want a huge wide screen television in your pocket. That was all I needed to hear–Apple is still the most user-friendly and I don’t use phones for TV. 3:00AM – Wide awake with a cold/flu thing I’ve had all week. Regret not ordering the phone online at 12:01AM. Decide to see if I can still buy it and get it shipped pronto. Realize that I don’t want to wait until October to get the phone, nor do I want to risk it getting stolen off my porch if I’m not home. The line was a swift 20 minutes. 11:05AM – Cook bacon and eggs, because it’s man’s cure for the common cold. 11:10AM – Pondering how all the stupid people are standing in line for the golden iPhone 5S. 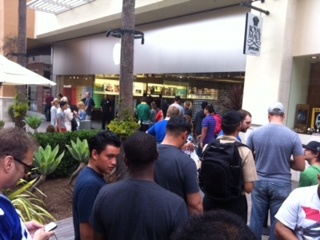 11:11AM – Kind of wondering if the line at Fashion Valley Mall in San Diego is actually already gone. 11:13AM – Decide it’s futile and it’s already sold out–at least according to the sensationalism in the news. 2:00PM – Fate strikes me–I want to beat all the high schoolers to the mall. I shower off the cold/flu germs, throw on clothes, and drive to the mall. 2:31PM – Keep walking past the line with my wayfarers on as if I don’t care and I actually went to the mall with no girlfriend on a Friday afternoon because I care about Zara clothing. 2:33PM – Turnaround just to ask how long the wait in line would be. 2:35PM – Get a ticket for the color phone I want and decide to stand in line for the first-time to quench my insatiable thirst for a opening day Apple phone. 2:55PM – Done with the line in 20 minutes! 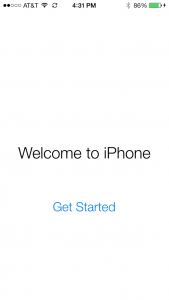 3:05PM – Apple Man offers me $48 for my old iPhone 4. He tells me a company will recycle the phone for parts, and they’ll put the $48 to my 32GB iPhone 5S. 3:06PM – I state that I’d rather see what I can get on Amazon or eBay for the phone. 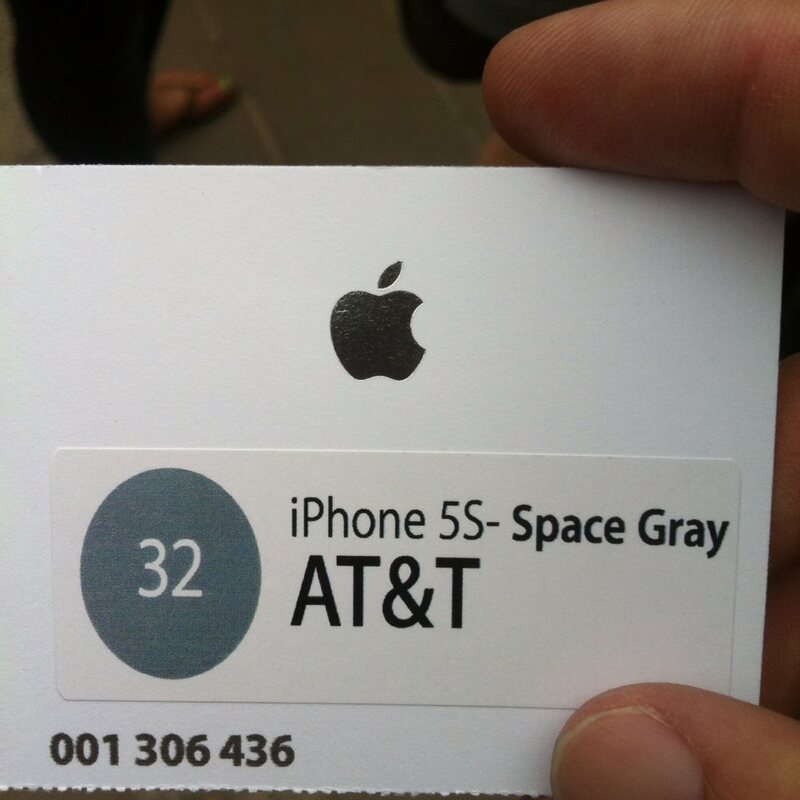 3:07PM – The nice Apple Man sees how much I would get for the iPhone 4 had the “Home” button been in pristine condition. I would get $122. He proceeds to ask management if I can get that amount for my “4”. 3:11PM – I take the $122 off the $299 phone! 3:15PM – Leave with an awesome new phone that’s wayyyy faster than my old one. What’s the moral of the iPhone 5S story? It just dawned on me, if I sold my iPhone 4 a year earlier, I could have gotten a lot more than $122 for it! Do you know how much new iPhone on a 2 year contract costs? Right now the 5C is only $99 for 16GB, and the more advanced 5S is $199 for 16GB. Seriously, how have I been been so ignorant this entire time? A year ago I could have gotten an iPhone 5 FOR FREE! You’ll get the value back for the 2 year contract price of a new phone. Even if your phone is in not-so-great condition, companies are looking to recycle the parts within your phone. You can still get good money for it. 2. Buy new phone with your $200+ on a new contract. 3. Rinse, repeat every 2 years. Ah man I can’t believe I held onto that iPhone 4 for a year longer than I needed to! If I had just been reselling my iPhones for $200+ every 2 years that would have been paying for new ones! 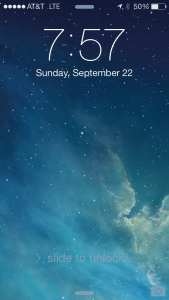 A note on the new operating system: Get the iOS 7 updated on your phone if you’ve got a iPhone 4 or higher. 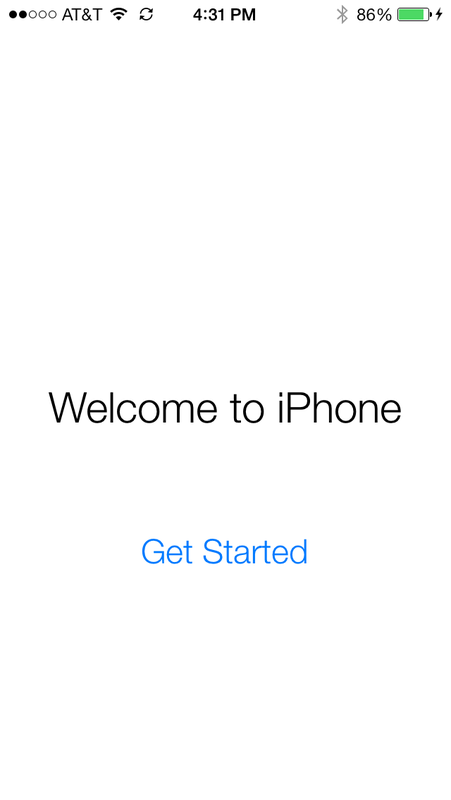 I updated my iPhone 4 it was definitely quicker with iOS 7 even after it being 3 years old. 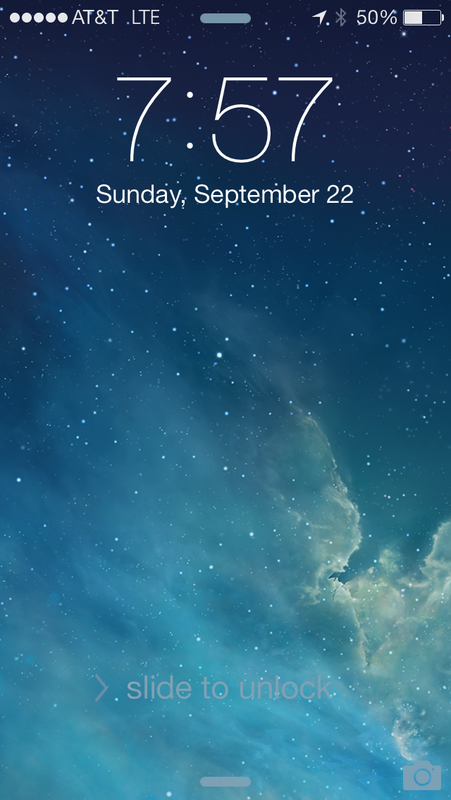 Lastly, here’s an awesome walkthrough with all the new little things that make iOS 7 so great for when you update it. Check it out–it won’t take long and it’s super helpful. I’ve never had an iphone before but I think that’s a great way to get a new one every few years. You might as well save on it if you’re going to buy one anyways! Absolutely!! Really, this strategy would work for any smartphone. Very cool! I’m looking to get out of the 2-year contract situation, so I’m going to balance moving over to something like straight talk or metro PCS with this. We have 2 iphones and JUST got out of our contract with ATT, so we’re looking at what to do next. I have a 5 (that I got for free from a “fancy friend” who doesn’t care) and my wife has a 4 she inherited from me, which I think I paid for a few years ago. i don’t remember. Are you just bringing those phones to another carrier? Is there any sort of obstacle with that? Even better you should sell your phone every 1 year. I sold my iPhone 5 for $460 (16GB) and bought a new 5S (64GB) for $399+tax/fees ($455). The necessitates you have to steal someone’s upgrade every other year. But that’s easy to do, there are enough people with family plans who don’t use all their upgrades, just ask. And then I sold my iPhone 5S for $1375, because I decided, I don’t need an iPhone. $1375?? Can’t you buy the 64GB for $750 unlocked?? Hmmm I never thought about approaching people with family plans. So you jump around onto other family plans, or just do that within your own family? “…if you don’t want a huge wide screen television in your pocket” – Your nephew’s a genius! So can I sell my iphone 5 and buy an iphone 5s if I’m only 1 year into my 2 year contract with verizon? You could sell your iPhone 5 and buy the 5S outright. It looks like used ones are selling for about $350 on Amazon. So you’d have to foot the difference. Which, if you were planning on paying $199 next year anyways that would be much of a difference. That’s amusing they had different lines for different colors, but I suppose it makes sense. That’s pretty awesome about the $122 – I think people would probably just take the $48 without thinking about if they could get a better deal, so great job! So are you using the fingerprint scanner?? 🙂 Hope you’re feeling better! Thanks for the well wishes Anna! I’m actually still recovering a bit. Still tired, but nothing like last week!! I definitely knew the phone was worth more than $48! My last iphone had the home button where at. After 3 years of pressing it, of course it’s going to be “sticky”! Yup, I love the fingerprint scanner. It’s SUPER convenient, rather than punching in the 4 digit code. Dang, I have an iPhone 4 in great condition that I am totally going to trade in when my contract expires in March. Or can I sell the thing now and upgrade while still under contract? You could sell it now and upgrade while under contract, but your phone company won’t subsidize part of the cost of the phone. They usually pay around $450 of the cost for you to commit to a 2 year contract. Yup, I wish I had done it a year ago!! And with my previous phone before that! I didn’t know the parts were worth so much. We sold 2 iPhone 3’s this summer on Ebay for $200. One thing about Apple is the great resale value. I’ve even gotten pretty good money for really old iPod’s. That’s a good point! I didn’t think of including that. They’re like the Hondas (maybe the Rolls Royce) of tech products. I bought my first iPhone (the 5) about 3 weeks before Apple announced the 5s was going on sale. Oh well, I still really enjoy it as it’s my first ever smartphone (even though I’ve owned macs and iPads for years…I know…weird!) I don’t think I’ll ever have a non-smartphone again.